Pancakes are just the best, right? Especially if you can enjoy them guilt-free! WHAT?! Yep – these guys are super healthy (made with oats instead of flour) and are beyond satisfying. Quick and easy to make, these pancakes are the best way to start your day and will keep you full of energy all morning. Sounds good eh? In a large bowl, add the ground oats, egg, milk, cinnamon and xylitol and whisk until well combined. Heat the olive oil in a frying pan over medium heat, then drop a in a large dollop of the mixture. Allow the pancake to cook on the underside for about 2 minutes before turning over for another minute. Remove the cooked pancake from the pan and set aside. Repeat until all the batter is cooked. Put the berries in a blender and blend until smooth. 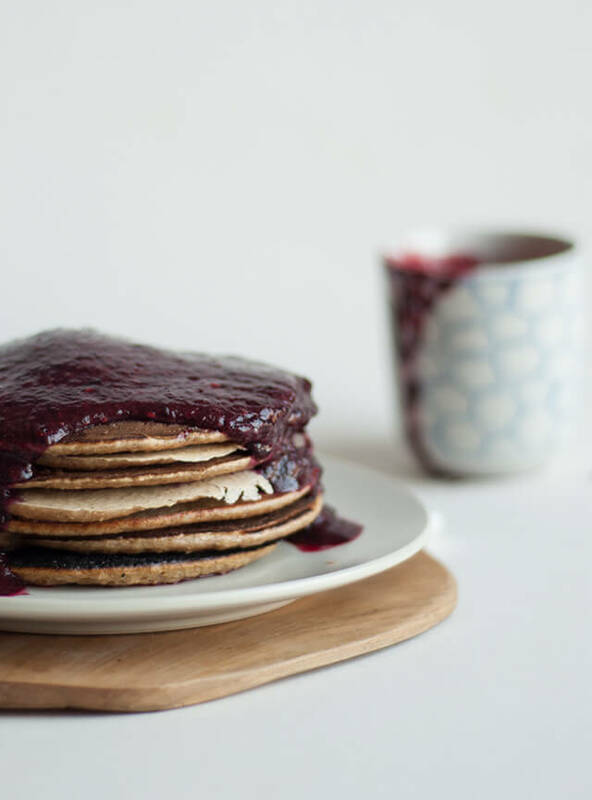 Plate the pancakes, pour over some berry pureé and serve.